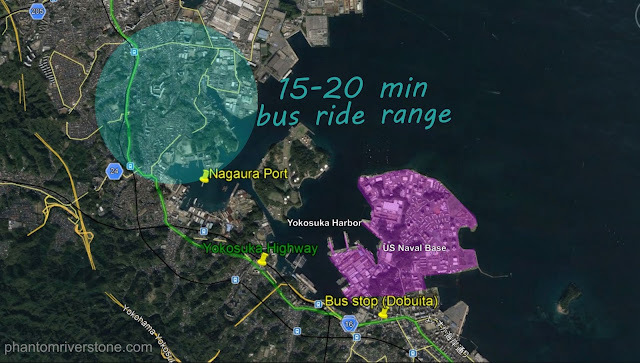 Various pieces of information about the location of New Yokosuka Harbor can be obtained by observing Ryo's journeys to the harbor. An obvious first pointer is the direction the bus is heading in when Ryo catches it at the bus stop near Dobuita Street: it travels from right to left past the exit of the street. However this alone is not conclusive: since we know that the bus follows a loop route (see previous article), potentially Amihama could lie the opposite direction. 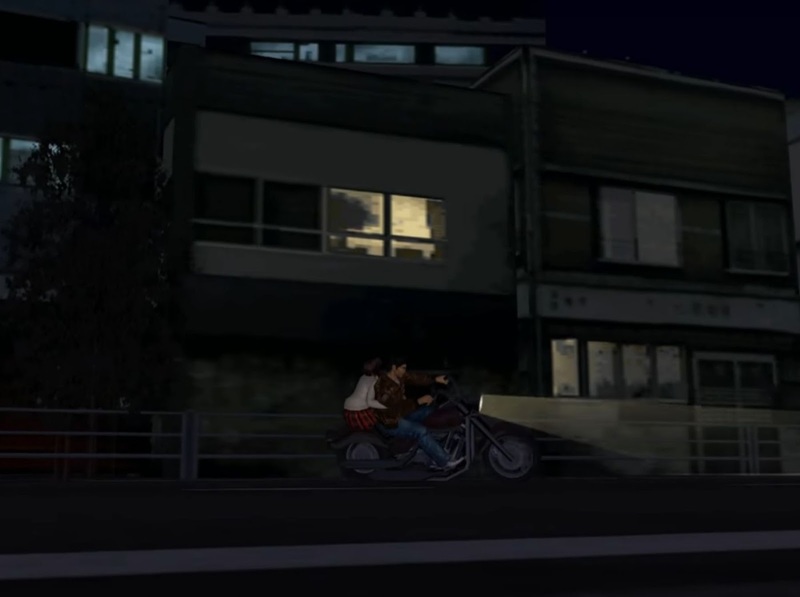 We can gain confirmation from a cutscene during Ryo's motorbike ride when rescuing Nozomi that occurs later in the game. 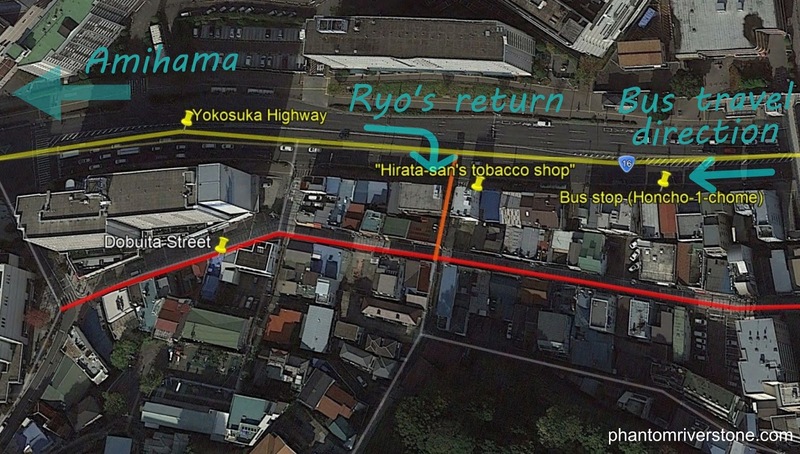 Ryo is shown turning into Dobuita Street on his return from the harbor: with the road from Amihama lying behind him (after which he turns a couple of corners, remaining heading in the same direction), he makes a right turn into Dobuita. 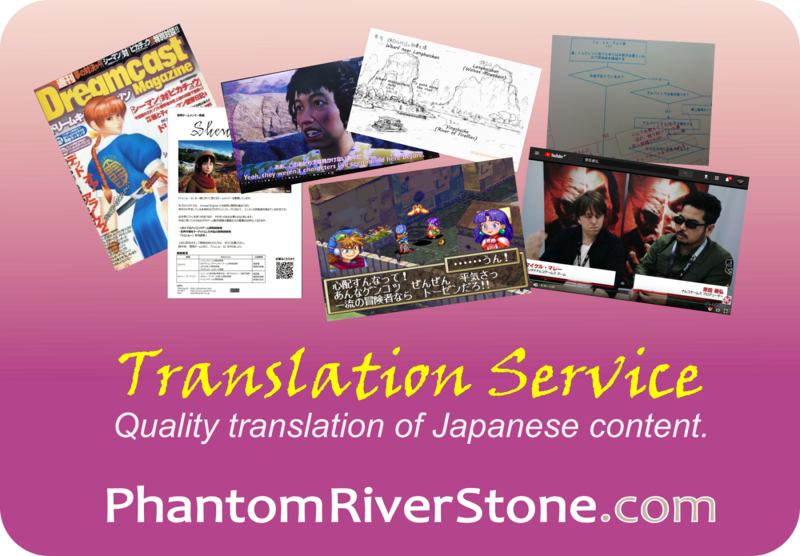 The image below shows an image of the real Dobuita area, annotated with this directional information. 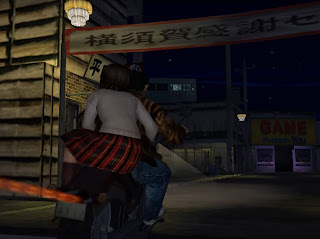 The section of the road that most closely matches the end of Dobuita Street as portrayed in the game is marked in orange (note: it is a short branch off the central street, and is not the true end of the street in real life). The direction of Amihama from the game, overlaid onto a map of the actual Dobuita Street area. 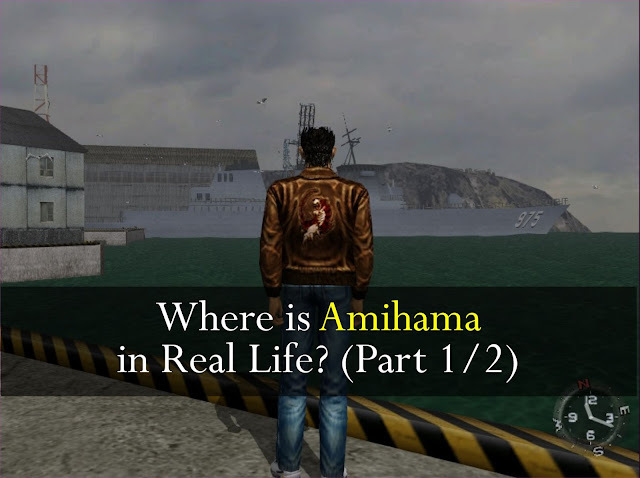 In theory it should be possible to estimate how far away Amihama lies by measuring the time it takes Ryo to arrive there. Unfortunately this turns out to be unreliable as there is some inconsistency between the two modes of transport he uses. Regardless of the time of day or night, the bus in the game consistently takes approximately 20 minutes of in-game travel time to take Ryo to the harbor from Dobuita, running at the sedate speed limit of 40 km/h. Of course, some of this time would be spent for passenger pick-up / drop-off and waiting at red lights. In contrast to this, Ryo's ride to the harbor on his friend Naoyuki's motorcycle takes the form of a high-speed dash (at a speed of up to 160 km/h) with no traffic signals to stop for along the way. Despite this, almost 30 minutes of in-game time pass during the ride (which corresponds to 2 minutes of real time). The motorbike segment has no doubt been extended to produce a satisfactory length of racing action, but both durations are likely to have been manipulated for the purposes of the game. In the case of the bus, some adjustment may have been made to ensure that a bus arrives at the bus stop precisely every 30 minutes. Of the two, it would seem sensible to exclude the motorcycle time for gauging the true distance, as the distance involved would take Ryo well outside the Yokosuka area if applied to an actual map. The bus time appears to be a more realistic indicator for where Amihama lies in relation to Dobuita Street. Experimenting with the transportation options in Google Earth gives an idea of how far a bus can travel in 15-20 minutes when caught from the bus stop next to Dobuita Street (the "Honcho-1-chome" bus stop). Aerial view of Yokosuka: the blue region can be reached by a 15-20 minute bus ride from Dobuita Street. It can be seen that a harbor area lies at the nearer end of this range, and it's name is Nagaura Port. Was the location of the in-game harbor at Amihama (left) chosen based on Nagaura Port? As can be seen in the image, features in common include navy ships being stationed there, the hills surrounding the port and a red-and-white communications tower. (Note that there is a red-and-white communications tower in the game screenshot partially hidden behind the building at the left). 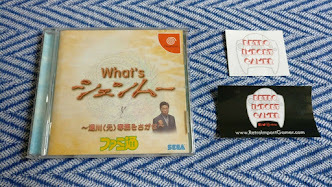 While not definitive, the Nagaura Port area appears to be a prime candidate for the location upon which the game's "New Yokosuka Harbor" may have been based. 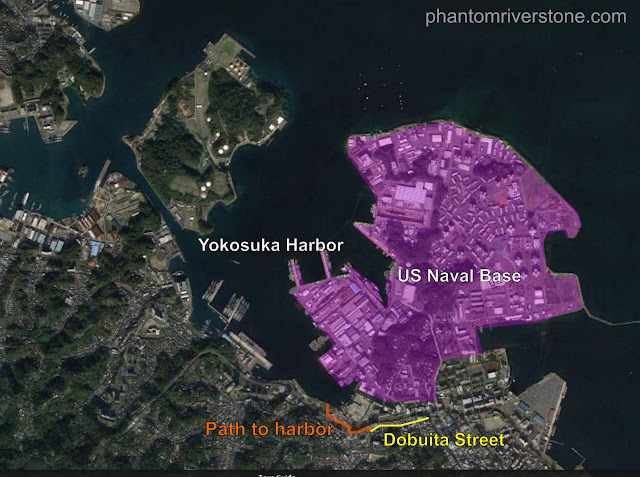 In the second part of this article, we will be examining further clues to build upon the case for this location potentially being the secret identity of the New Yokosuka Harbor in the game. As always, please leave your own theories or comments below! Great work as always, Switch! Locals must think us fans are crazy to hold the place in such reverence! 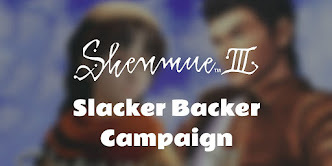 :) There are also some great fan videos on YouTube as well that give a good taste of the area - but there's nothing like going there yourself.